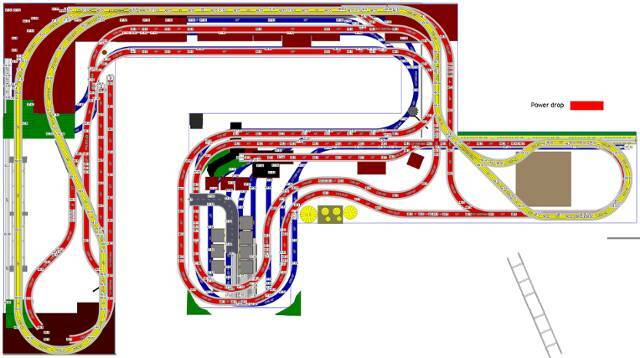 I'm New to o scale layouts this is my first layout that's more than a 4x8 with track screwed to it. A little about me. I have had trains pretty much my whole life. My father bought me an ho set when I was a kid and put it on a 4x4 sheet of plywood it had one switch and a engine house that was it I kind of remember a tree too. that didn't last long as a 6 year old kid. 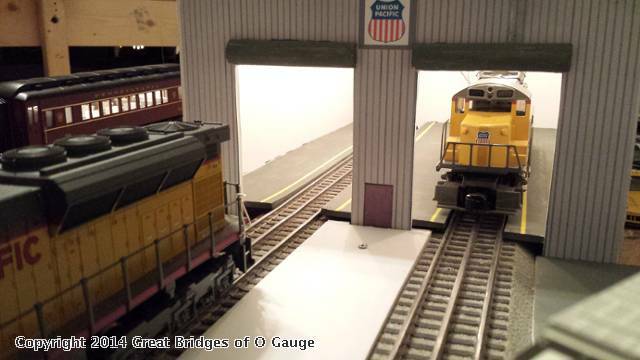 then he got me a n scale that was in a box that had plastic scenery and even a manual turntable and round house. it was called cannonball something. I later bought my own ho kits and build a 4x8 in the basement but a house fire ruined that for me. 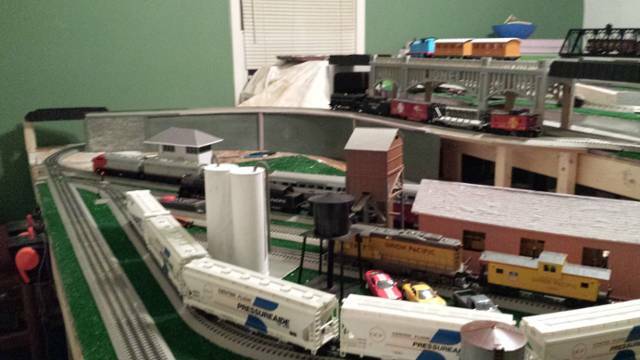 so as a teen I didn't do to much with trains. 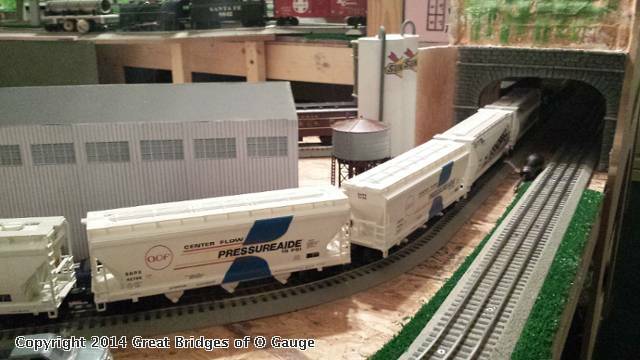 but in 2001 I bought a Santa Fe Flyer set from Lionel and went to the Lionel open house and bought a bunch of other rolling stock and another engine. that was used for a little while then put in the attic. 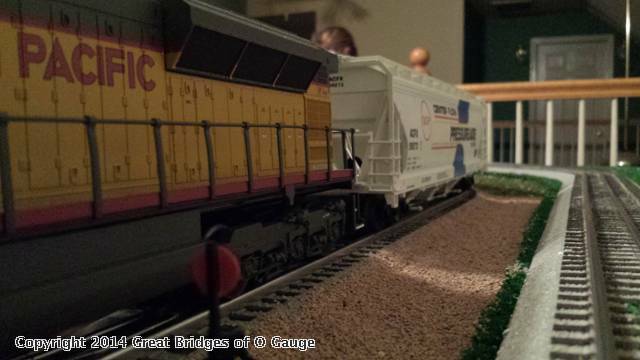 last summer while in Michigan on vacation to see family I was given a new engine (not new but new to me) three of my uncles do o gauge also. 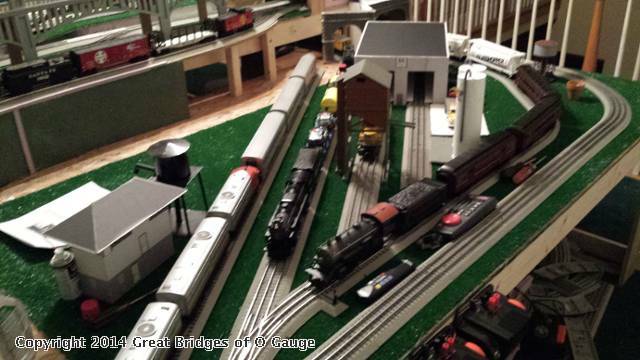 One of my uncles has been collecting trains since he was a young kid. he just passed about a month ago at the age of 73 so as you can imagine it's quite the collection the family is still trying to figure out what to do with it all. but anyways I was given a 1957 Santa Fe f3 powered and dummy. which sparked pulling the stuff I had back out of the attic. 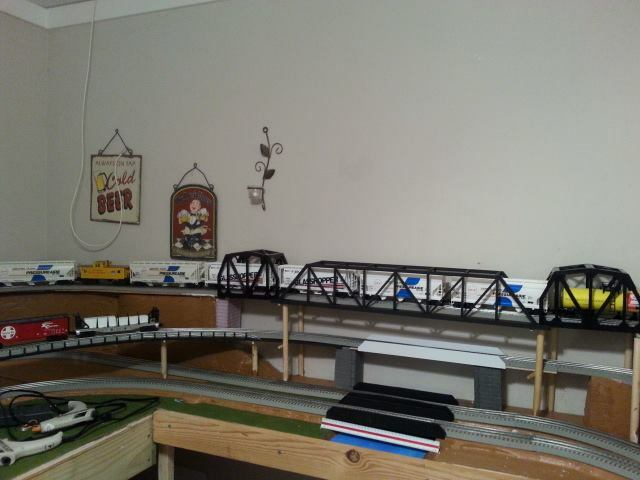 since then it's been either a buying spree of building things to get a layout together. 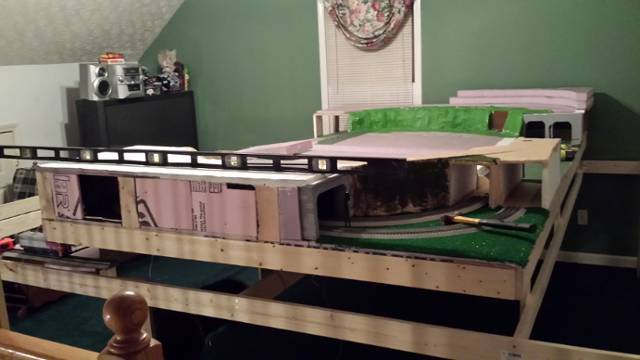 I have a spare bedroom in the basement which is where I put the layout. the room is 11 by 11. my wife wanted to help so she being height challenged didn't want 4X8 because she couldn't reach across so max width was 40 inch's around all 4 walls. me having 4 complete trains I wanted to run all 4 together. but the limited space only allowed for 2 main lines. and I left a space for a yard at some point. I bought a cab 1 tmcc for the layout even tho I only have conventional trains at the moment. one main is flat around the whole layout and the other has an elevation. 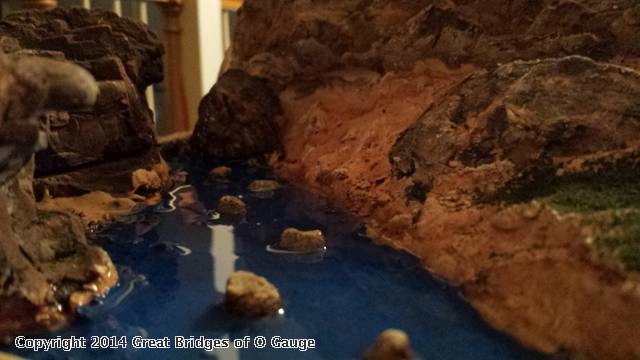 this is where the bridge's come in. I have built now 5 bridges. 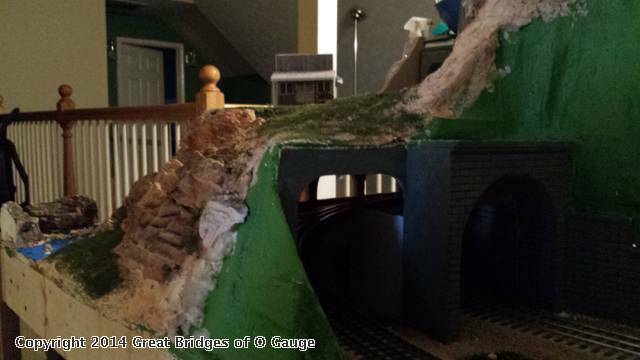 and total investment has been about 10 bucks the first bridge I built was from a piece of pvc window jam I found in the shed. it's shapped like an H when you look at the end I cut 2 legs off of it so it would be a U shape then measured and cut doun the middle of the u to give me 2 l shapes then used the the first legs cut to length and glues then between the 2 l shapes to give me a basic girder bridge. I then cut 45 degree angles on both ends and glued a sliced down old credit card to the tope edges then sliced up an cigertte pack to make strips and glued them to the sides for ribs. I know this isn't making any sence but maybe pictures will help. you can see more pics there. 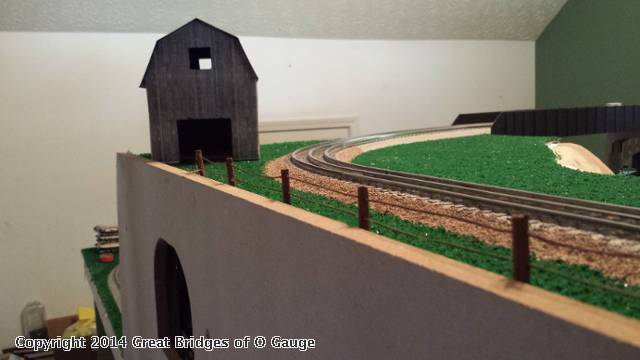 but the main reason for the post is I am looking for that centerpiece bridge on the layout and I really don't know what to do for one? any ideas would be great. 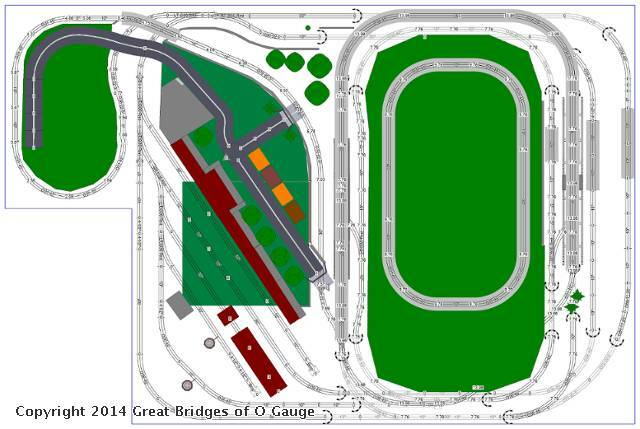 figured I would add a pic of the layout plan too. Looks like a lot of fun John, and thanks for sharing. Please let me know if you'd like to exchange links with your Blog, we're happy to do it. Hope you will share more of your photos and experience with us. I just checked out your site and you layout progress looks great. You have a lot of pink foam in use. Its great stuff to do mountains and elevation changes. The majority of our layout is covered by the stuff. I am looking forward to more photos of the station that you started. It looks impressive. Plan 2062 - CNoR 2nd Class Station. thank you I am enjoying building it. yea I took that layout apart it was nice but there was flaws. so I rebuilt a new one . Wow! That's great! Thanks for the update. 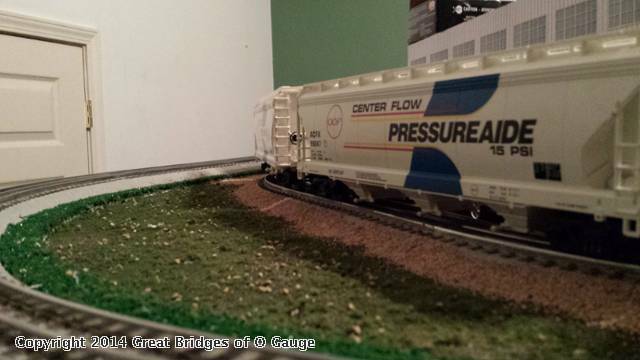 to keep sound down with fastrack I'm using indoor/outdoor carpet but still want realistic scenery so I am trying to mate the carpet with regular ground foam also ballasting the track with carpet under it. it's kind of different. Sounds like some neat ideas there. Does it keep it quiet? yes it does just like running on a carpeted floor. some spots I have the bare table top (1/2 osb board) and you can hear the difference between the bare area and the carpeted area. in these two pictures you can see the transition between regular scenery and the carpet. I have been following you on the OGR Forum too. Your comments about the carpet interested me. 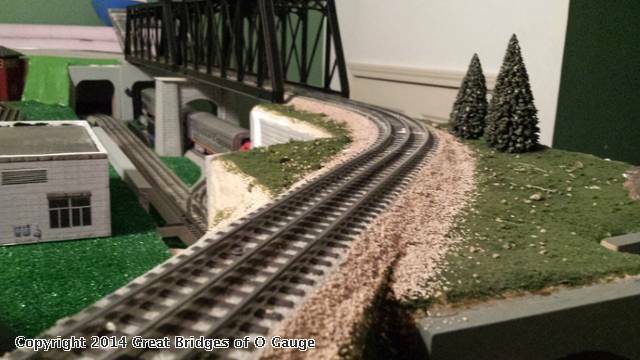 Having modeled in HO since the late '60s, I have always used cork for roadbed. The green carpet (or white for Christmas) always seemed like it would make a layout look too toy train like for my tastes. Nothing wrong with it, but I am used to making scenery out of plaster or foam. Foam is loud right under the tracks, so I put cork on top of that. 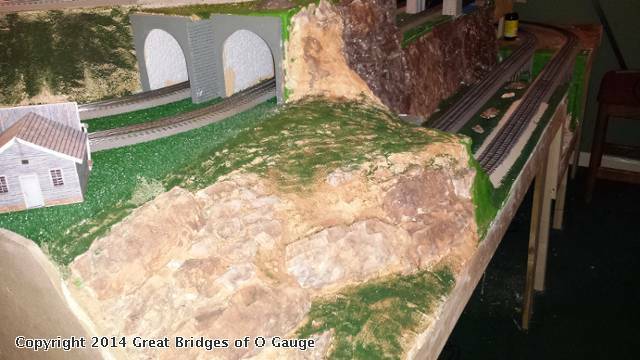 I can see here where you have carpet cut just a little past your ballast and then have other scenery. I will have to consider the carpet under my track. 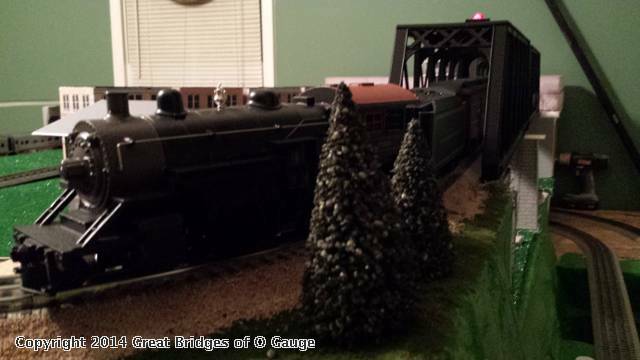 Noisy track is okay for post war trains, which I have a couple. However, I having 4 modern engines with sound, I want to keep the track noise down to hear the sound systems. I don't know which I want to get. I have been trying different varieties on small test loops. Right now, I am thinking GarGraves or Atlas with Ross switches. That may change. Thank you.